Have you ever noticed the weird connection between photography and hunting? You go out to “shoot”; You are “taking shots”; And best of all when a bunch of us photographers get together we call it a “big shootout”. It turns out that there is yet another connection, the gear connection. Now don’t get me wrong, I am not pro weapons of any kind (other then shooting this person that keeps clinging to me on the bus…), but some of this gear used for guns and rifles can be really useful when dealing with photography equipment. The first item is a rifle strap. As a former solider, I can say that a comfortable strap can make or brake your day back. There was nothing more “fun” then having to haul the rifle anywhere you go. And by the evening time each day, I was not even sure that I have a shoulder. 1. Today’s straps are wide, and distribute the pressure on the entire shoulder surface. Kinda useful if you are carrying a Nikon D2X with a 17-200 f/2.8 lens. 2. Straps are adjustable in length, so you can adjust them you your height, and gear. You can also adjust them to carry on the shoulder or neck or crossed. 3. Modern straps have a quick-adjust-click-thingy that can instantly shorten the length of the strap. Very useful for moving from neck to cross. 4. The straps are strong and have good gripping things on the end of the straps that will never break. Those features make the rifle strap a great replacement for the standard camera strap that leaves your neck so sore at the end of the shooting day. A personal favorite of mine is the 400501 by Hagor – an Israeli based company that specializes in personal combat gear. (See bottom-right). The second item is a gun carrying case. For very reasonable price (a bit less then 12 dollars) this case is a great bargain. 1. 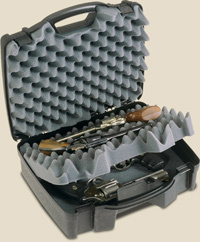 It has two foam protected compartments that will protect your gear from impact. 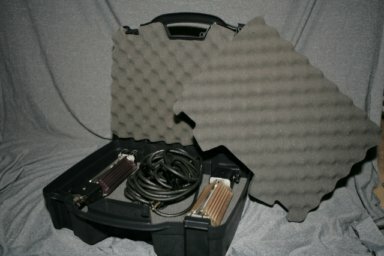 The foam will also protect your gear from moving freely in the case. 2. The casing is strong and stiff and will protect your when traveling. Indeed it is not the most fast-drawing way to store the gear, but it is certainly one of the safest ways. The Plano casings are sold on Amazon here. Have a cool carrying tip? Ping us a on the comments or post it on the flickr group. DIY – The Cheap Yet Shamefull Underwater Camera Housing DIY: The Super-Small Bottle-Cap Tripod 5 Cheap & Indispensable Photography Gear Recommendations Is it worth going into debt to buy gear?